What an attractive bug! It was crawling leisurely around our courtyard and begging to be photographed! I succeeded in taking quite a number of its image, but an insect with nothing much around isn’t so exciting to view! Isn’t it wonderful – to admire its beauty collectively all at once in a single photo? Well, it would appear as if 6 individual images were cropped and pasted together to create this lovely photo collage, which is feasible. 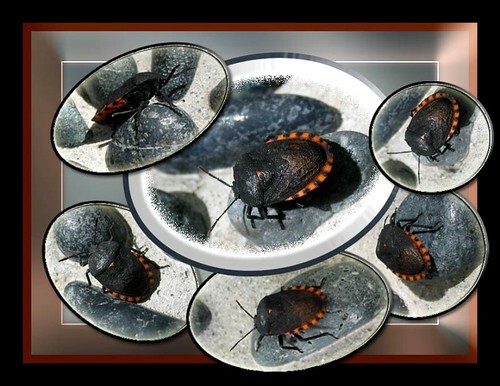 However, basically here I have chosen to stage prominently the insect that was already in the background photo that I’ve selected, by creating a vector shape around it, and then dragged in another 5 cropped images to complete the collage. I had preferred the vector shape because it is very flexible where I can expand, reduce and reposition the shape as I deemed fit to harmonize with the other 5 additions. Step 1. Envisage a theme for your collage. Then, start off by drawing a rough sketch of how you want your collage to be, giving thought to the target size and where each photo is to be placed. Itâ€™s advisable to assemble all your desired photos into one project folder in Windows Explorer. Do not use original photos, instead create a new folder, then copy and paste all your photos into it and rename them. In this example, I have selected these 6 images – one as the background picture for the collage, plus the addition of another 5 images of quite similar setting which I’ve renamed as Bug #1 to Bug #5 to coincide with my rough sketch and the clockwise manner each image will be added later on. A little effort attending to these minute details from the beginning goes a long way…you’ll see! Step 2. In Photoshop, open all the images – Choose File > Open and browse to select the images that you want. Click Open and the images will be opened one by one and stacked on the screen. Then, check each to see that all the images are of the same resolution – Choose Image > Image Size, and change resolution and size if necessary. Here, I’ve reduced the size of each image from its original 1600 x 1200 pixels to recommended web publishing size of 800 x 600 pixels and retain original resolution of 180 pixels/inch. Move to arrange the images (click on image title in blue and drag) on the screen in such a way that at least their image title is visible, so as to target the image easily. Step 3. We will start with the background image (i.e. Collage Background Pic). Our job is to prop up the pretty bug in it by creating an illusion using the vector shape, clipping mask and applying the various layer styles. Target the Collage Background Picture by clicking anywhere on it to activate it and drag it into position on the screen to display the whole picture. In the Layers Palette, double click on the Background layer to unlock it and rename it Collage or whatever name you wish. With the Collage layer still selected in the Layers Palette, you’ll need to duplicate it. Go to Layer > Duplicate Layer > OK or press the shortcut keys Ctrl+J to bring forth a Collage copy. Double-click on the words of the layer to change its name to ‘Pretty Bug’ for easy identification. Step 4. Now, you’ll need to create a new layer below the Pretty Bug layer. With this layer still highlighted, simply hold down your Ctrl key while you click the New Layer icon at the bottom of the Layers Palette and a new layer will emerge between the two layers of Collage and Pretty Bug. Double-click on this new layer and rename it ‘Vector’, as this is where a vector shape will be created. Step 5. Next thing to do is to define the shape of the illusive cropped picture using any one of the Vector Shape tools. 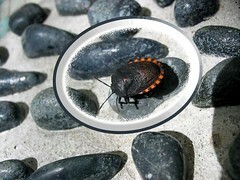 In this example, I’ve dragged out an ellipsed shape around the pretty bug. With the Vector layer selected in the Layers Palette, choose the Ellipse Tool from the Tool bar on the left (the Vector Shape tools are located directly under the Type Tool), then click and drag it over the image area that you’d want your cropped picture version to represent. If the tool is not visible, click at the location and hold down the mouse button to select your tool from the fly-out list. The shape to be drawn need not be precise, just an appoximate one will do since you can transform it later. Once the vector shape is drawn, you’ll observe that the Vector layer in the Layers Palette has changed, creating 2 thumbnails – a color box for the layer and another for the vector mask. You can click on the vector mask thumbnail to toggle on and off. Step 7. You’ll then need to use the vector shape to create a clipping mask. This means that it will clip the layer above it into the dimensions of the cropped version of the picture. To do this, hold down the Alt key and move your cursor directly between the Pretty Bug and Vector layers in the Layers Palette until you see your cursor change into the clipping mask icon. Then, double-click to create the clipping mask. You will know that you’ve done it correctly when the Pretty Bug layer is indented to the right, confirming that it’s clipped by the vector shape below it. Step 8. With the clipping mask, you’re now able to frame the cropped image to bring it into focus or stage the pretty bug by just applying a few layer styles. With the Vector layer and mask thumbnail in the Layers Palette still being selected, click on the Layer Style icon at the bottom of the palette and select Blending Options (or double-click to the right of the Vector layer) to open the Layer Style window. In this example, I’ve applied a Stroke, Inner Glow and Bevel and Emboss. (a) Stroke – click on the name Stroke on the left side of the Layer Style window to open its options for you to choose. Check that Preview (on the right side of window) is selected to allow you to view simultaneously the effects of your choices made on image itself. Here, I’ve set the following options: Stroke size – 10px, Position – Inside so that the stroke appears within the boundaries of the vector shape, Blend mode – Normal, Opacity to 100% and color #3a4751 (a dark grey color taken from the cropped picture – click on the color box to open the Color Picker, then use the Eyedropper Tool to select the color from your image and click OK when done). Do not close the Layer Style window yet as there are 2 more layer effects to be applied. (b) Inner Glow – click on the name Inner Glow to bring out its options. Selections made were: Blend Mode – Dissolve, Opacity – 100%, Color – White #ffffff, Technique – Softer, Source – Edge, Choke – 44%, Size – 60px, Contour – Linear, deselect Anti-aliased, Range – 20%. (c) Bevel and Emboss – click on the words Bevel and Emboss to open its options. The choices made were: Style – Inner Bevel, Technique – Chisel Soft, Depth – 151%, Direction – Up, Size – 30px, Soften – 6px, Angle – 30º, select Global Light, Altitude – 30º, Gloss Contour – Rounded Steps, deselect Anti-aliased, Highlight Mode – Screen, Color – White #ffffff, Opacity – 100%, Shadow Mode – Multiply, Color – Black #000000, Opacity – 25%. Also, click on the word Contour on the right side of window, and for Contour – pick Linear (click on the drop-arrow to open the Contour Picker to make your choice), deselect Anti-aliased, Range – 0%. Step 9. Next, to crop and drag 5 smaller images of the same bug onto the Collage Background Picture one at a time and add a fancy border too. We’ll start off with Bug #1 image. Activate by clicking on it and bring into focus the whole picture. Then, select an Elliptical Marqueue Tool, located on the top left of the Tool bar (if tool is not showing, click at the location and hold down the mouse button to select your tool from the fly-out list), and drag out an elliptical selection around the bug. If you need to reposition your selection as you drag, just hold down the keyboard’s spacebar and move your mouse around to reposition it, then release the spacebar to continue dragging out your selection. And if you’re not satisfied with the selection, simply click inside it to deselect and start again. Step 10. You’ll now need to drag the cropped selection onto the Collage Background Picture but before this can be done, activate the Collage Picture window first and check that the correct layer in the Layers Palette is selected. Just remember that whenever an image is dragged in, Photoshop will automatically place a new layer above the selected layer. So, in this case, select the Pretty Bug layer since our 1st added image is to be placed above it at the top right section. Now, reactivate the Bug #1 image, and tap V to bring forth the Move tool, click anywhere on the cropped bug image and drag it onto the Collage Picture window. Observe that as this 1st image is added to the Collage, a new layer named Layer 1 is produced in the Layers Palette. You will need to reposition, resize and probably rotate the added image – so, tap T to bring out the Free Transform box and handles around it. Then, similarly as was done to the vector shape at step 6 above, do your desired changes here too. To resize, simply hold down Shift as you click and drag a corner handle, or holding down Shift+Alt as you drag will cause the shape to resize from the center. Should you need to rotate the shape, move your mouse anywhere outside the box and when the cursor change to a double-sided arrow, click and drag as desired. To reposition, click anywhere inside the box and drag the shape to your desired location, or nudge it with the arrow keys on your keyboard. To accept the changes, press Enter or double-click inside the Free Transform box. Finally, close the window of the Bug #1 image as you have no further need of it. Step 11. Continue to crop and drag onto the Collage Picture window the rest of the images (Bug #2 to #5) in the same manner, one at a time. For each image, repeat steps 9 to 10 above. In this example, I’ve positioned the added cropped images in a clockwise manner, starting with the Bug #1 at 3 o’clock and moving on in numerical sequence to #2 and so on. Remember to target the correct layer in the Layers Palette of the Collage before each image is dragged onto it (I believe, scrutinizing the picture below can guide you here). 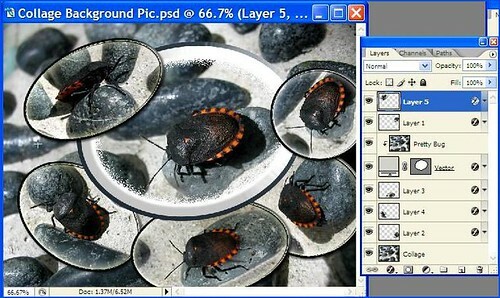 Note that as you drag in the cropped images of Bug #2, #3, #4 and #5, their corresponding new Layer 2, 3, 4 and 5 will emerge in the Layers Palette. You can always rearrange the stacking order of the layers or the way the layers overlap by simply selecting the layer in the Layers Palette and dragging it above or below another layer. Note that in the stacking order of layers, the higher up on the stack the given layer is, the closer to the top of the overall photo it will be. So play around until you’re happy with the results. The image above will give you an idea of the whole Photoshop process thus far, which includes step 12 below. I’ve included a view of the Layers Palette to enable you to see the correlation between the various layers and the Collage Picture. Probably this can assist you to understand better…yes? Also, you would have noticed that the cropped images of Layers 1-3 have been positioned a little outside the boundary, purposely done so that they’ll emerge beautifully when a frame is added later on at step 14 to complete the collage! (a) Select layer – Start off by targeting the Layer that you want to work on in the Layers Palette. Select Layer 1 (I chose to start with this layer) and double click to the right of Layer to open the Layer Style window. (b) Stroke – click on the name Stroke on the left side of the Layer Style window to open its options for you to choose. Here, I’ve set the following: Stroke size – 4px, Position – Inside, Blend mode – Normal, Opacity to 100%, Color – black #000000. Do not close the Layer Style window yet as there are 3 more layer styles to be applied. (c) Inner Glow – click on the name Inner Glow to bring out its options. Selections made were: Blend Mode – Screen, Opacity – 75%, Color – #ffffbe, Technique – Softer, Source – Edge, Choke – 0%, Size – 30px, Contour – Linear, deselect Anti-aliased, Range – 50%. (d) Bevel and Emboss – click on the words Bevel and Emboss to open its options. The choices made were: Style – Inner Bevel, Technique – Smooth, Depth – 100%, Direction – Up, Size – 8px, Soften – 0px, Angle – 30º, select Global Light, Altitude – 30º, Gloss Contour – Linear, deselect Anti-aliased, Highlight Mode – Screen, Color – #cdcbcb, Opacity – 75%, Shadow Mode – Multiply, Color – Black #000000, Opacity – 75%. Also, click on the word Contour on the left side of window, and for Contour – pick Sawtooth 1, deselect Anti-aliased, Range – 20%. (e) Drop Shadow – click on the name Drop Shadow to bring out its options, and select: Blend Mode – Multiply, Color – black #000000, Opacity – 55%, Angle – 120º, deselect Global Light, Distance – 5px, Spread – 0%, Size – 5px, Contour – Linear, deselect Anti-aliased. (Tip – There’s an easier way to set the Angle and Distance options. With the Layer Style window open and set to Drop Shadow, simply click anywhere inside your image and drag your mouse around. As you drag the mouse, you’ll see the drop shadow being created and the values for Angle and Distance changing dynamically. Stop dragging when you’re pleased with the results). (f) Acceptance – View cropped image to see the overall effects of the Layer Styles applied. If you’re satisfied with all the styling effects made on your photo, save your current styling settings as a New Style for future use by clicking the button displayed on the right side. When its small window pops up, name your new style, select Include Layer Effects and Include Layer Blending Options, then click OK to save and close. Saving it as a New Style is useful here as I’ve decided to apply the same layer styles to the rest of the 4 images. Now, to accept all and close the main Layer Style window, click OK. Should you change your mind again after exiting, just return to it by double-clicking on the Layer style button (letter f with a circle) to the right of layer in the Layers Palette and make the desired changes. (g) Apply Layer Styles to remaining 4 cropped images – Work on one image at a time, starting with Layer 2 and ending with Layer 5. Target Layer 2 in the Layers Palette and double-click to the right of it to open the Layer Styles window. Here, you need not repeat the whole processs of 12(b)-(e) above. Simply selecting Styles on the top left of window to display the collection of preset styles and then choosing the ‘New Style’ that was saved earlier at step 12(f) above will automatically apply the whole layer effects on it. Click OK to accept and close window. Next, continue to do the same for the remaining 3 images by targeting the relevant Layer each time you want to apply the same layer effects. (a) Inner Glow to whiten – click on the name Inner Glow to bring out its options and select: Blend Mode – Screen, Opacity – 100%, Color – white #ffffff, Technique – Softer, Source – Edge, Choke – 0%, Size – 250px, Contour – Linear, deselect Anti-aliased, Range – 30%. (b) Bevel and Emboss to give 3D textured look – click on the words Bevel and Emboss to open its options and choose: Style – Inner Bevel, Technique – Smooth, Depth – 100%, Direction – Up, Size – 10px, Soften – 0px, Angle – 120º, deselect Global Light, Altitude – 30º, Gloss Contour – Linear, deselect Anti-aliased, Highlight Mode – Screen, Color – White #ffffff, Opacity – 75%, Shadow Mode – Multiply, Color – Black #000000, Opacity – 75%. Also, click on the word Texture on the right side of window and for its Pattern – click on the drop-arrow to open the Pattern Picker and select Satin (128 by 128 pixels, Grayscale mode), Scale – 60%, Depth – +40%, deselect Invert, select Link with Layer. (c) Stroke to present a distinct contrast between the white texture and the black border – click on the name Stroke on the left side of the Layer Style window to open its options and set the following: Stroke size – 4px, Position – Outside, Blend mode – Normal, Opacity to 100%, Color – orange #ff5a00. At this stage, the Stroke effect is not seen but will be visible when a black border is added later on. (d) Acceptance A final check on the Collage image to see the overall layer effects and if acceptable, simply click OK to accept and close Layer Style window. Step 14. A simple black border to frame the Collage Picture will be just perfect to complete the whole process. To do this, select the Collage layer in the Layers Palette, then click on the Create a new layer icon at the bottom. Double-click on the name of the new layer and rename it Border. Next go to Image > Canvas Size and in the window, enter the amount of increase in width and height size according to unit measurement that you desire, then click OK. Here, I’ve increased 80(W) x 80(H) pixels. The transparent border is now visible, so too are the 3 out-of-boundary images and the orange stroke applied earlier! Next, color the border black – tap D to set the foreground color to black, then tap G to activate the Paint Bucket Tool and fill it up. (Tip – if you want to use a color from the collage, use the Eyedropper Tool to extract the color). VOILA!! SEE AND ENJOY THE COMPLETED PHOTO COLLAGE AGAIN!! I did…have fun again playing with the various layer styles options availabe!